When Edna O'Brien's first novel, The Country Girls, was published in 1960, it so scandalized the O'Briens' local parish that the book was burned by its priest. 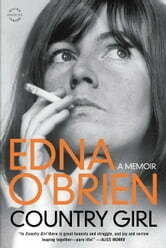 O'Brien was undeterred and has since created a body of work that bears comparison with the best writing of the twentieth century. Country Girl brings us face-to-face with a life of high drama and contemplation. Starting with O'Brien's birth in a grand but deteriorating house in Ireland, her story moves through convent school to elopement, divorce, single-motherhood, the wild parties of the '60s in London, and encounters with Hollywood giants, pop stars, and literary titans. There is love and unrequited love, and the glamour of trips to America as a celebrated writer and the guest of Jackie Onassis and Hillary Clinton. Country Girl is a rich and heady accounting of the events, people, emotions, and landscape that have imprinted upon and enhanced one lifetime. Girl Walks into a Bar . . .